I really had to dig deep through the blog archives to see when, oh when did I even start this thing! I got the yarn when it was just released in Fall of '06 and started the knitting some time early in December. I remember that I started this on a sick day - I was in bed, freezing, wearing wooly things and needed something soft and colorful to keep me busy. I don't think I ever thought it would be two summers later before it was wearable, though. Don't you love knitting? Barbara Walker is right up there with Elizabeth Zimmermann as one of the veritable forces of nature in the recent-history of our craft. Aside from her most well-known contribution and complete re-invention of the stitch dictionary, she is also credited with exploring, dissecting, and propagating knitting from the top down, not just sweaters mind you - hats, dresses, pants and more! Her book is a classic and comes highly recommended from me. She is truly a wonder. If you've never knit a sweater from the top down, you must try it. 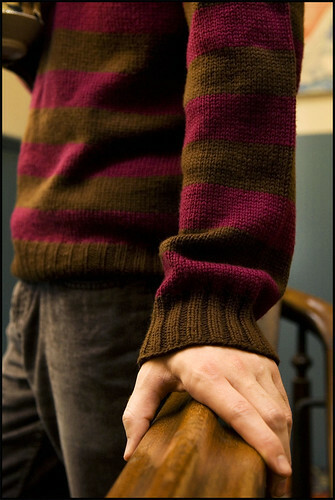 My very first sweater was knit in this manner,and I've always had a fondness for it. Aside from one minor drawback, it's full of all kinds of advantages, the most valuable being absolute control over length in body and sleeves and the try-on-as-you-go possibility. As you're knitting, you can don your garment as many times as you need in order to get your lengths just right before that final bind off. (In fact, you could technically knit the sweater whilst wearing it, as exhibited on the book's cover, although I don't recommend it.) (Yes, I tried) If your sleeves grow after washing, just rip out the bind off, tear back an inch and bind off again. It's all very convenient. The drawback? The sweater gets a little cumbersome and large towards the end, when you're finishing off that last sleeve you may get a little tired of flipping the whole thing around as you're knitting. I think, though, that this is a completely reasonable price to pay for the obvious benefits of top-down knitting (intuitive points, check). [EDIT] Awesome tip left in the comments by Miss Sandra - after finishing the yoke, knit the sleeves first. When you're ready to start the body, tuck the sleeves inside the yoke to minimize all those awkward appendages while turning your knitting. It won't change the weight of the garment, but will definitely help with the cumbersome aspects of maneuvering your sweater. (Thanks, Sandra!) Also I forgot to mention, EZ recommends (in Knitting Workshop) to keep the bulk of the garment in a canvas or cottan bag as you work for ease of turning. [EDIT] I forgot again to mention something important about my stripes! This info is also true for my striped vest, as I seemed to get a lot questions about jogs with that project as well. In all of my striped projects, assuming I'm working with only 2 colors, I employ this technique for jogless stripes and carry the unused yarn along the inside of the garment, wrapping the colors around each other at each color-change to catch the unworked yarn and keep things clean on the inside. There are no extra ends to weave in, and the beginning of the round is almost completely invisible on the RS of the fabric. All in all, I'm really happy with how this turned out - while I don't love knitting with superwash, i do like wearing it. Also, it's definitely an interesting wardrobe item color-wise. And speaking of color - I apologize for the slight deviation in color-correctness from photo to photo. Magenta and warmish brown really like to trick my camera! Up next, a ginormous wool blanket that can swallow people whole. Not kidding. Great colour combo and finished product.....I'm so thankful for Barbara Walker!! I am an obsessed reader of Knitting magazines but I hardly see pictures that nearly as artistic and beautiful as yours! Beautiful sweater. I like it when men aren't afraid to wear some color. I love the stripes! The colors are great together. well done Jared! Another beautiful sweater and as always the writing and photography are superb. And I know that you are enjoying school and I'm glad you are pursuing that, but I think I probably speak for a lot of people when I say, "I'm glad the year is over...we sure have missed you." I had the pleasure of meeting Barbara last year, I took a class she taught for the AKG. It was a blast, but she hasn't knit in years, and I mean YEARS and she's written books on all sorts of other topics that have nothing to do with knitting, which is so interesting and neat, when that women gets into something, SHE GETS INTO IT! lol She didn't know what self stripping sock yarn was, I don't think back when she knit regularly they had figured out how to dye it that way, or at-least not commercially. She was so nice, and I even got to buy a little barbie outfit/dress she knit up on the tiniest needles ever. Such a neat lady. Now I just want to meet Meg Swanson and my life will be complete. Very nice! Love the colour combo. I think superwash yarns usually grow some when you hand wash them; they like to be thrown in the dryer to tighten up again. Gorgeous! You really have the best men's knits out there. It looks great! Comfy looking, too. I can't believe how well those colors go together. I'm a bottom up person. I just can't get over flipping a big hunk of knitting every row. Dave's right. Give it a ride in the dryer. Magic. I agree that knitting from the top down has advantages.I remember my Grandma knitting sweaters this way when I was a kid.As I grew so did the sweaters-at lease for couple of years. (kids grow fast)I am just deciding what material to use for a raglan sweater for myself and this my be the time to try this technique. Your work is beautiful and precise. Lovely sweater! 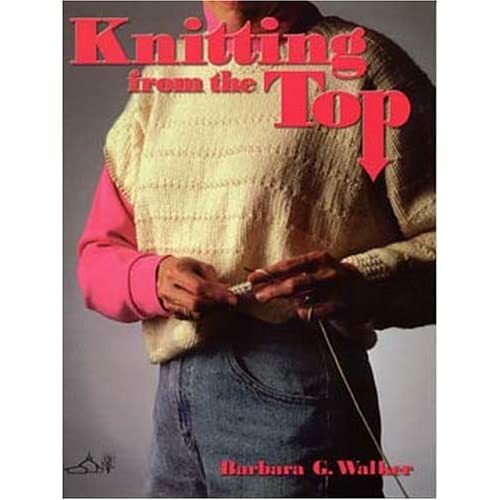 I too am a huge fan of Barbara Walker and _Knitting from the Top Down_. I've read it from beginning to end and am currently swatching for a skirt. Her directions are fantastic and the lines are classic-- so it's a book that will be useful to many for a very long time! I love this color combination. It's so unexpected! And the fit is flawless, of course. I love your sweater! And your posts, designs, and photographs of your knitting and spinning are such an inspiration. Thank you so much. Barbara Walker was indeed an interesting person, and she has also written books about feminism and the "goddess" that make for an interesting side bar to research her other work. Delurking to say I love the sweater- it's beautiful and inspiring, as are all of your projects. When I saw the first photo, I thought surely the yarn had some silk in it- there seems to be a sheen on it. So I was wondering if the Swish really has a little bit of shine or if it's more matte in person? I do love your projects- everything you make is truly inspiring. I have to be honest here and say that this is one that I've been secretly hoping to see in it's finished form. I love the colour combo and the drape of it. It really is an attractive sweater and I can TOTALLY picture it on my brother. Nice work Jared, as always. I'm so excited to see this project completed and congratulate you on the very flattering photos of it as well. jared, it's beautiful! i love the stripes, the colours, the v-neck, the fit ... how come i still don't own knitting from the top? shame on me! Your pieces are outstanding.. such a joy to see, as well as your photos! 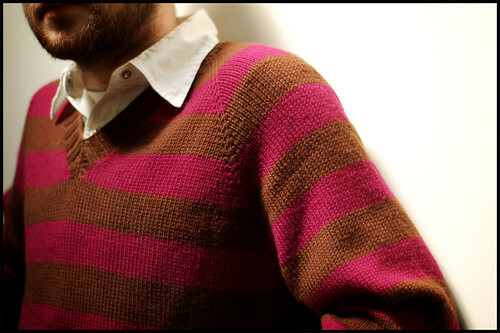 This is one of my favorite knit things you've blogged about. Amazing. This is the kind of garment I would steal from my husbands closet for myself. It looks great. 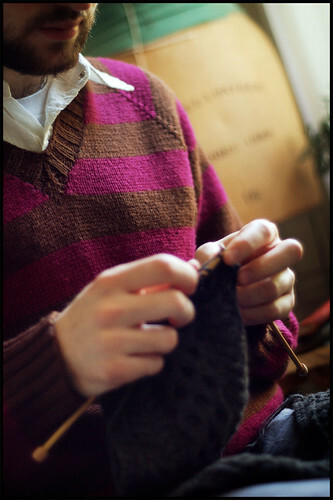 Jared, I do all my sweaters Barbara Walker style and found that if I do the sleeves just after I join the body, I can pull the finished sleeves to the inside of the body to keep them out of the way whilst finishing the body length of my sweater. The weight is still there but on the body, not the sleeves. By doing the sleeves first, it insures that I have enough yarn for both sleeves in case I'm not sure at the start of the project. Your v-neck finishes are fantastic. Jared, the sweater is fabulous (as usual)! This is the most masculine and rugged I have ever seen magenta look, and I like it. Kudos! Great colors! Thanks for the details. The sweater is fabulous! I am eager to see the blanket! Love the stripes and the colors. I'm working on a top down raglan right now for the hubby and I'm at the it's so big it's annoying stage, but I hope it's worth it in the end. Come to Wyoming and you can wear your sweater all year - 40s yesterday, rumored 60s today (but with a 30 mph wind of course). I don't have anything original to say, but it seems important to add my voice to the chorus of hurrahs because your work is so good. Thanks for sharing. I'm still absorbing so much about knitting and yours' are posts I always look forward to. Keep it up, please! So beautiful! I mostly knit toys but this is the year of the sweater for me (one in process another in the planning phase). You have completely sold me on the top-down method and I am going to find myself a copy of that book. Thanks for the inspiration. As always completely stunning. I was wondering when you were going to get around to finishing this. With the invent of Ravelry we are all forced to face our UFO more regularly aren't we? Your work is always so beautiful and inspiring. This blog is always a joy. I think this is my favourite item of all your finished knits. Such a handsome sweater! You've given me heart for two reasons: one, I love hearing that knitters I admire also have difficulty finishing projects from time to time, and two, it gives me incentive to take up my striped top down raglan again. Yours is really beautiful. Amazing how sometimes simplicity is so much more dramatic than complexity. I'm with Sel marvelling at the evenness of your raglan increases/decreases. Could you tell us which ones you use to get them so even and symmetrical? I've always struggled with that. 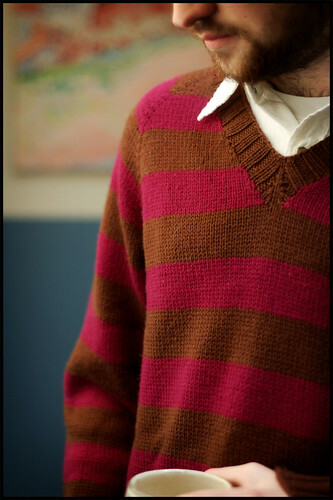 Beautiful colours, as always, in this sweater, Jared. PLEASE come live at my parent's house so that my younger brother can grow up to be just like you! He's on his way, but you are undoubtably one of the classiest people I've ever not met. Absolutely gorgeous and I'm totally jealous! Have this project in my favorites and LOVE the colours!!! p.s. and I agree with the sleeves, i do it all the time when knitting from the top down. Just FYI: to "don" something means to put it onto your body... not to "dawn" something as you wrote. :) You've inspired me to start thinking again about that sweater's worth of Swish Superwash I have in my stash. Also, I'm glad to know how it reacts to handwashing. Hmm. It's a perfectly wonderful sweater. I've contemplated many a top down sweater, but I've never got past the half-way point of the yoke. It feels like climbing up hill and that section of shoulders and arm intimidates me. But I really do appreciate the suggestion for the sleeves. If I ever complete a yoke, I will remember that tip. We're kindred spirits when it comes to wool. You introduced me to Beaverslide, for which I am eternally grateful. I'll knit little things with cotton, but never a garment, because the feel of it doesn't make me happy like wool does. Thanks for the inspiration and great photography. I'm in the middle of my first top-down sweater and I'm sure I have you to thank for that! I'm already a convert!! I'm especially happy to be figuring out the top down sleeve cap shaping business, as that's my preferred sleeve method even with sweaters that are knit from the bottom up. You waxed poetic about this ages ago, and I've bookmarked that post and reread it regularly. But it's only now that I'm actually doing it, that it all makes sense. I'm rambling .. thanks, as ever, for your wonderful inspiration! Love, love, love the new sweater! No surprise though, all your work is so amazing. Do you have a pile of knits somewhere that didn't turn out right, so they don't make the blog? Stuff that just doesn't make the brooklyntweed criteria? Do you EVER knit a catastrophe? I highly doubt it. Love the picture of you with knitting in hand. It's like seeing Michelangelo with his Sistene-chapel-ceiling-in-progress. Congratulations! 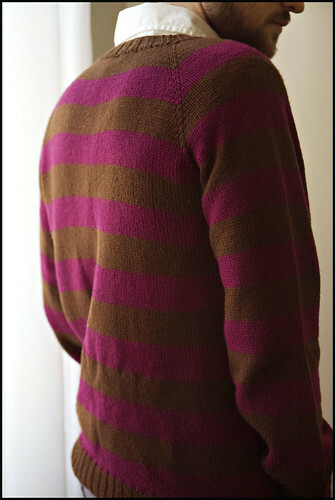 I started reading your blog around the time you started this sweater and I have secretly wondered what happened to it. I love the colors. Although you make some good comments about the lack of wooliness with superwash, I think I might try my hand at a KP Swish sweater! Wow!!!! You're an inspiration Jared! Those photos are magnificent and you've been finishing up a whole bunch of things lately! Awesome and great job! I just love that color combo. Sort of like chocolate covered raspberries! Yummy! Very gorgeous. Good job ! oh yes there are a few heroines when it comes to knitting technique. and i love them and they inspire me every day. i need that book though. great sweater and i agree about superwash. the woolier the better. i want to marry a wool shearer. What a great classic sweater! I love that you turned it up a notch by using colours that pop. Love it! Gosh. I completely concur about the materials making the project (and whether is is ever finished) a success. If I hadn't run out of yarn earlier this week, I'd have already finished the vest I was working on. I was just liking the experience of the yarn so much. As always, amazing work! I love the colors because they could work for a man as well as a woman. Oh, wow. The colour combination, the amazing stitch uniformity, the simplicity of the pattern all come together in a stunning pullover! Thanks also for the tips ... very helpful! what an awesome sweater! i love the details you shared with us. I love the color combo! I would never have thought about trying those two together.What is your secret? I've recently discovered the same thing about superwash, and it only took me two years of knitting with wools to do so. It just feels squeeky and 'lifeless' and makes me not want to knit on my projects that use it. I'm glad I'm not the only one! I used to think that I would hate to hand wash sweaters, but I discovered that I'm too paranoid to put my handknits in the washer--superwash or not. jared, this is SO nice... the color combo is fantastic! and thanks for all the top-down info. that is something i've never tried and i'm going to check out walker's book now. and the weather change was so weird... i was in a sweater fri night too and suddenly it's florida-style sticky. I'll have to put a top down sweater on my list of things to try! Excellent work, as per usual! Here's another benefit of knitting in one piece: all your stripes match up effortlessly at the shoulders! I love all of your work, Jared! So inspiring. If you are missing sweater weather come on back to the pacific northwest...summer STILL hasn't started here. Man that's a handsome sweater and you wear it so well! The striped sweater is gorgeous! Luv the colors and the knitting tips. Have finally purchased the yarn to make my hubby your cobblestone. I am so excited about knitting this one. I look at the picture in IK and just imagine how nice the finished sweater will look. Keep knitting and blogging! You definitely have all of our attention out here in blogger/knitter land. 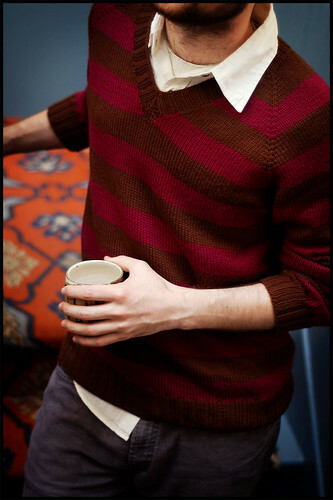 This is going to sound so bizarre since we're talking about yarn here, but that sweater looks good enough to eat! Hee hee. I love the chocolate-raspberry color combo, just gorgeous. Thanks for posting the jogless job tutorial! Great, great sweater, though. I love seeing your knits. Love the colors in your sweater and your detailed and charming posts, as always. I've used the magic raglan recipe for top-down knits (from Hand Knitting Techniques from Threads Magazine--see my post in ravelry at http://www.ravelry.com/projects/woollymama/magic-raglan) for many sweaters and cardigans, but haven't tried one with a V neck, so may use my BW Knitting from the Top Down as you did to make one. Ironically, I've decided to junk the magic raglan and use your Cobblestone with the gray Debbie Bliss Aran Tweed, as the last Cobbestone I made for my son was such a hit! Can't wait to see the ginormous people-eating blanket! Boy, glad I'm not the only one with WIP's that date back several years. I bet that you aren't getting much sweater wear in the temps that NY is having. I LOVE this sweater!! I've said this before but your taste in color/texture is impeccable! Thank you for sharing with us - keep it up! i love this sweater. it totally inspired me to make my own version, only in smoke grey and sunshine/butter yellow. i even bought knitting from the top down, and it is a wonderful reference. My grandmother has Knitting from the Top and has ever so kindly lent it to me, but I am worried that this particular sweater is a bit above my comprehension level. Do you have any suggestions for patterns which are similar to this one? A friend of mine has fallen in love with it and I really want to make it for him, but I also want it to be something I know I can do. Thank you! A beautiful sweater but, more important, so beautifully knit. Your blog inspires! I have just reserved Barbara Walker's book via my online library catalogue! You don't have to turn the whole sweater when knitting in the round. At all. What I do? I knit one round, then turn the work clockwise 360 degree (kind of like hanging from the yarn - except it is not hanging) then keep knitting. Do you see what I mean? It is so easy and logical to do - and not simple to write. I try again: let's pretend you knit with double-pointed needles. Each time you finish to knit one needle, you turn a little bit the work anti-clockwise to get to the next needle. Well simply when the work become too twisted on your lap, turn it in the other direction (clockwise). Try it and tell me what you think. As always, I love your blog and your photos. THIS SWEATER IS AMAZING! The colors look fantastic together, and it looks completely machine made. I remember when you started this project, and I drooled. I love, love, love the stripes and colors. I am glad you finished...I soooo want one!